One Sunday, I was standing in the foyer of a church just before Mass. As we waited for the opening procession to begin, the parents of one of the young servers came into the church. As the father carried one child and shepherded the other children through the foyer, he smiled at his son, and with a broad smile, said: “do a good job!” After a moment, his father returned and surprised his son with a big hug. The server squirmed a little with embarrassment, but I noticed that after his father went back into the church, the boy could not stop grinning. I found myself grinning as well, and I rejoiced that the parish had such a father who loves his children and brings them with joy to the worship of the Lord. Today, we continue our celebration of Christmas with the Feast of the Holy Family, and our scripture passages offer us advice for faith-filled family life. The readings begin with advice from Sirach, an author who interpreted early Jewish traditions for his day. In this case, Sirach’s thoughts derive from the fourth commandment, the honor due to parents, and spell out the concrete meaning of “honor.” He roots the authority of parents in the authority of God and calls upon children to care for their parents, especially in their old age. In Sirach’s day, such care was a practical necessity, but his advice runs deeper. His words recall that Israel itself is like the family of the Lord. As a parent, the Lord is faithful and unselfish. The Lord seeks, and demands, only that which is good for the people. Their obedience to the Lord is one part of a fruitful, life-giving, mutual relationship. As the Psalmist acclaims, it is a relationship of divine blessing. Sirach applies that model to parent-child relationships. By mutual care and service of one another, the parents and children find material and spiritual blessings. Like Sirach, the letter to the Colossians offers advice to the believer for wholesome living. The advice is directed to Christians in general, asking them to allow the grace of faith to transform their relationships. Their prayerful worship of the Lord Jesus instructs them in the virtues necessarily for good living in a difficult world. The list of qualities to seek is ideal, but it is also a wise list. These very qualities respond to the realities of conflict and human sin and egotism. The letter goes on to apply this approach directly to family life. It is here that contemporary people sometimes become uncomfortable with the language of the letter, but we should not loose sight of the whole context. The summons here for wives to be subordinate, fathers to love, and children to obey, are examples of relationships transformed by the example and grace of Christ who made himself subordinate for our sake, who loved us to the end, who gave the gift of perfect obedience to the Father. In the passage from Luke, we are reminded that even at the very beginning of Jesus’ story, the shadow of the passion falls upon the manger. Sin and selfishness cannot abide the light and evil rouses its powers to return all to darkness. But Luke makes it clear that while evil may appear to have power, the greater power of God’s love, promised by the prophets, directs these events. The passion will come, although even there light will triumph. And here at the dawn of the story, we meet men and women who remind us to look to that light whatever the circumstances – whatever the cost. In Simeon and then Anna, we meet wisdom and faith in action. In Mary we see the mother who has given herself entirely to the nurturing of God’s gift to her. Her heart has already been revealed in her fiat and her magnificat. And in that heart we see the eternal redeeming love of God at work. One day, the Church will acclaim her “God-Bearer,” but here we see the woman and mother. And we grasp that even as she is mother to the Lord, she becomes Mother to all who call Him Lord. 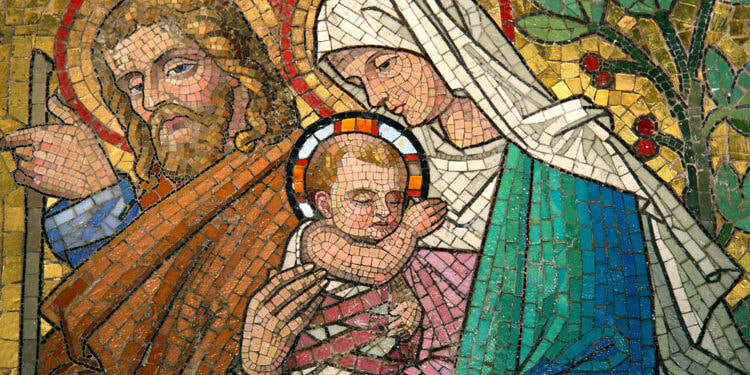 In Joseph, we meet the man charged with the protection of the child Jesus. The right man for this sacred duty, his humility and selflessness served not only to protect Mary and her child, but all of our hopes and dreams. How honored and praised should he be among all who call Jesus Savior? The gospel calls for the transformation of all Christian relationships, but this feast highlights the importance of family relationships. The church cannot accomplish its mission without parents who love unselfishly, raise their children to the light of God, and protect them from the darkness of the world. On Gaudete Sunday, I was tempted to speak with that father after Mass and tell him how moved I was by his example, and how grateful I am for his faithful fatherhood. Regrettably, I did not speak with him then, but I thank him now. And I thank the many other men like him who have the courage, strength, and humility to do for us as Joseph did for Jesus.